The older we get, the faster life seems to move. And taking care of ourselves only gets more important with age. For parents, life can feel like warp speed. The responsibility of caring for others can sometimes make caring for ourselves feel like an afterthought. But ensuring our own health by connecting the mind & body is the single most important thing we can do before we can effectively take care of others. While this is going to be a different journey for everyone, we can all recognize that there is a connection between how we feel emotionally to how we feel physically. And finding the right balance between the two is fundamental to a happy and healthy lifestyle. Exercise, sleep and a nutritious diet are three things we can all maintain on a daily basis. As adults, we generally know our bodies well enough to know how much sleep we need to function. More important, we are all familiar with what our bodies feel like when we haven’t gotten enough sleep. Whether its a lack of focus or irritability, the affect is universally adverse. The challenge is following through on making time for these fundamental needs. Despite understanding the importance of sleep, sometimes life gets so busy that we simply forget to make time. We all sometimes stay up too late, even when we know it will be to our own detriment. These are the moments in which we can be our own worst enemy. Whether its getting a good night of sleep, maintaining a healthy diet, or sticking to a routine exercise schedule, we know there is a relationship between doing those things and how they make us feel. There are so many ways to explore the relationship between body and mind. But making time for these fundamentals is where it all begins, and these choices ultimately determine how we present ourselves, and who we are on a daily basis. Expressive – Creative arts therapies are based on the premise that when someone works creatively, they become more expressive and communicative. Whether its through music, dance or creating literal works of art people can reduce stress and anxiousness while simultaneously building confidence. Emotional – Mindfulness is a nonjudgmental awareness in which each thought, feeling, and sensation that arises is acknowledged and accepted. Simple as it may sound, mindfulness transforms how we relate to events and experiences. It creates a more spacious way of being in the world that is less reactive and generally happier. It lets us pay attention to our health, relationships, and environment. Mindfulness helps us discover our purpose and path and in doing so, it contributes to a happier and healthier community as a whole. Physical – Yoga is a physical activity that includes stretching and strengthening poses, breathing exercises, and a variety of meditation practices designed to specifically connect body and mind. It uses deep breathing and heightened senses to center ourselves and to achieve physical and emotional harmony. No matter what type of path you choose to explore, the key is to take care of yourself. Whether its through sleep, exercise, or one of the approaches above, connecting emotional and physical health is essential to inner peace and happiness. Time flies and life moves quickly. Its a lifelong journey. By taking of your own health and well being, you can ideally take the time to enjoy the ride. 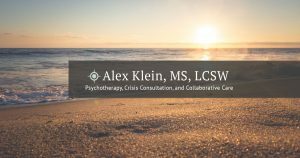 For more information or to schedule and appointment please contact me at 203-499-7890 or alex@akleintherapy.com.